“Larvatus prodeo,” announced René Descartes at the beginning of the seventeenth century: “I come forward, masked.” Deliberately disguising or silencing their most intimate thoughts and emotions, many early modern Europeans besides Descartes-princes, courtiers, aristocrats and commoners alike-chose to practice the shadowy art of dissimulation. For men and women who could not risk revealing their inner lives to those around them, this art of incommunicativity was crucial, both personally and politically. Many writers and intellectuals sought to explain, expose, justify, or condemn the emergence of this new culture of secrecy, and from Naples to the Netherlands controversy swirled for two centuries around the powers and limits of dissimulation, whether in affairs of state or affairs of the heart. This beautifully written work crisscrosses Europe, with a special focus on Italy, to explore attitudes toward the art of dissimulation in the sixteenth and seventeenth centuries. Discussing many canonical and lesser-known works, Jon R. Snyder examines the treatment of dissimulation in early modern treatises and writings on the court, civility, moral philosophy, political theory, and in the visual arts. 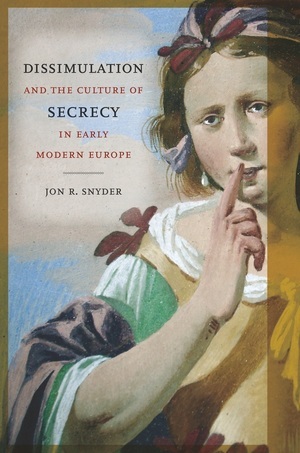 Jon R. Snyder is Professor of Italian Studies and Comparative Literature at the University of California, Santa Barbara. He has most recently published a bilingual edition of G.B. Andreini's 1622 comedy, Love in the Mirror, as well as a book on Baroque aesthetics, L'estetica del Barocco.